The Standards and Guidelines for Quality Assurance in the European Higher Education Area (ESG) 2015 were adopted by the Ministers responsible for higher education in the European Higher Education Area in May 2015. The first Standards and Guidelines for Quality Assurance in the European Higher Education Area (ESG) were adopted by the Ministers responsible for higher education in 2005 following a proposal prepared by the European Association for Quality Assurance in Higher Education (ENQA) in cooperation with the European Students’ Union (ESU), the European Association of Institutions in Higher Education (EURASHE) and the European University Association (EUA). Since 2005, considerable progress has been made in quality assurance as well as in other Bologna action lines such as qualifications frameworks, recognition and the promotion of the use of learning outcomes, all these contributing to a paradigm shift towards student-centred learning and teaching. Given this changing context, in 2012 the Ministerial Communiqué invited the E4 Group (ENQA, ESU, EUA, EURASHE) in cooperation with EI, BUSINESSEUROPE and EQAR to prepare an initial proposal for a revised ESG “to improve their clarity, applicability and usefulness, including their scope”. The revised version of the “Standards and Guidelines for Quality Assurance in the European Higher Education Area”, commonly known as ESG has been endorsed by the Bologna Follow-Up Group (BFUG) in September 2014. The Standards and Guidelines for Quality Assurance in the European Higher Education Area (ESG) 2015 were finally adopted by the Ministers responsible for higher education in the European Higher Education Area in May 2015. As a result of a participative revision, involving both the key stakeholder organisations and ministries, the ESG 2015 reflect a consensus among all the organisations and ministries involved on how to take forward quality assurance in the European Higher Education Area and, as such, provide a firm basis for successful implementation. 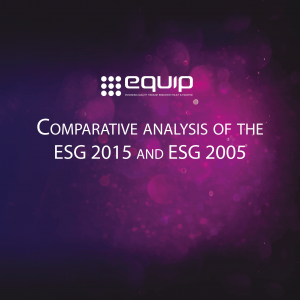 The EQUIP project has published a Comparative analysis of the ESG 2015 and ESG 2005. This paper provides an overview of the changes in the Standards and Guidelines for Quality Assurance in the European Higher Education Area (ESG) as they were adopted by the Ministers responsible for higher education in 2015 in Yerevan compared to the ESG first published in 2005, including an outline of the changes in the context, scope, purposes and principles; a description of changes in the wording of the standards; and an analysis of the content of the related guidelines. The EQUIP project is also collecting examples of good practice on the use of the ESG 2015. If you have a good practice example of dealing with or using the ESG 2015 as a tool for change, or of good practice in quality assurance in line with the ESG 2015 you can submit it on their website. Read more about the Standards and guidelines for quality assurance in the European Higher Education Area (ESG) on the ENQA website.